As a full-service intranet consulting firm, Prescient is capable of going end-to-end on a project—from the Assessment and Planning phases, straight through to Implementation. A thorough understanding of our clients’ business and technical requirements for the new intranet (e.g. desired tools, functionality and content). Knowledge of the priorities and pain-points felt by all those involved with the intranet (from regular users and content creators, to key stakeholders and steering committee members). Clear direction for how to complete the remaining phases of the project, and bring the intranet to fruition as it was originally envisioned. Recognizing the value we offer in the development stage of an intranet redevelopment project, our clients often request us to implement the intranet plans and roadmaps we create. We achieve this goal by utilizing Social Business Interactive, a division of Prescient Digital Media. SBI develops world-class social business platforms and sites in SharePoint and other .NET technologies, including ECM, WCMS and portal solutions. SBI is an expert in using and deploying Microsoft SharePoint, the worldwide leader in enterprise intranet and social business collaboration (more than two-thirds of our clients use SharePoint, and most of the rest use other .NET solutions). Social Business Interactive also delivers solutions that integrate with a multitude of third-party solutions. Shared vision of how to approach and manage intranet redevelopment projects, from planning and assessment, straight through to implementation. 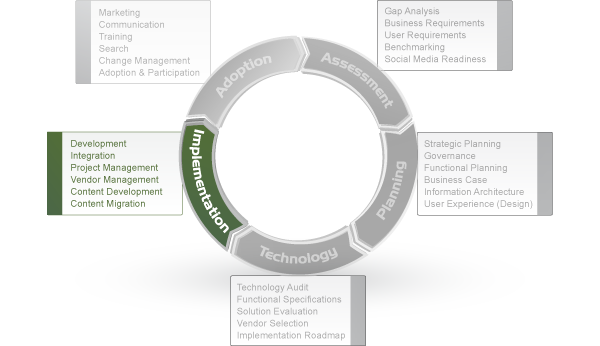 Complementary methodologies, which prioritize user requirements and buy in from key stakeholders. Shared understanding of the business values of corporate intranets, and the significant ROI organizations can achieve when the right steps are taken. SBI and Prescient share the same philosophy and approach to intranet redevelopment projects, and this offers clients an excellent opportunity to ensure the implementation effort goes according to plan. SBI’s implementation methodology, which was crafted with Prescient’s proven methodology to intranet redevelopment projects in mind, guarantees the intranet planning deliverables will be implemented as originally envisioned by our clients and the consulting team. SBI has a strong understanding of how to optimize the SharePoint environment to account for various intranet ownership models. SBI will ensure that SharePoint accommodates the governance model that has been recommended for our clients. SBI will leverage SharePoint’s capabilities to ensure content is organized based on the way users think. SBI will implement the recommended information architecture and wireframes to improve the quality and accessibility of information. SBI will maximize the information’s usability and manageability based on Prescient’s plans. SBI will utilize SharePoint’s capabilities to ensure the recommended design concepts are implemented as originally intended, including layout, style guide, and branding. SBI will leverage SharePoint’s capabilities to implement all the desired features and functionality of the new intranet, ensuring employees have all the tools and applications they require. SBI will utilize SharePoint’s capabilities to ensure all workflows, content types and meta tagging strategy is executed according to plan. In conclusion, the synergy of Prescient and SBI offers organizations an excellent opportunity to ensure the new intranet is implemented as smoothly as possible.